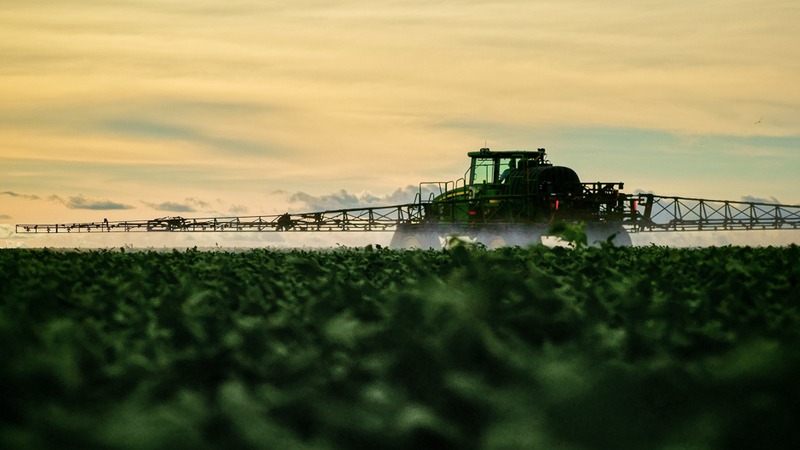 A tractor sprays soybeans in Mato Grosso do Sul, Brazil. Photo: Claus Isenberg. Creative Commons BY-NC-SA 2.0 (cropped). The world’s food supplies are at risk because farmland is becoming rapidly concentrated in the hands of wealthy elites and corporations, finds a study by a small international non-profit organization, GRAIN, that works to support small farmers and social movements in their struggles for community-controlled and biodiversity-based food systems. The following is an abridged version of this important report, “Hungry for land: small farmers feed the world with less than a quarter of all farmland”. Governments and international agencies frequently boast that small farmers control the largest share of the world’s agricultural land. Inaugurating 2014 as the International Year of Family Farming, José Graziano da Silva, Director-General of the United Nations Food and Agriculture Organization (FAO), sang the praises of family farmers but did not mention the need for land reform. Instead he stated that family farms already manage most of the world’s farmland — a whopping 70 percent, according to his team. Another report published by various UN agencies in 2008 concluded that small farms occupy 60 percent of all arable land worldwide. Other studies have come to similar conclusions. But if most of the world’s farmland is in small farmers’ hands, then why are so many of their organizations clamouring for land redistribution and agrarian reform? Because rural peoples’ access to land is under attack everywhere. From Honduras to Kenya and from Palestine to the Philippines, people are being dislodged from their farms and villages. Those who resist are being jailed or killed. Widespread agrarian strikes in Colombia, protests by community leaders in Madagascar, nationwide marches by landless folk in India, occupations in Andalusia — the list of actions and struggles goes on and on. The bottom line is that land is becoming more and more concentrated in the hands of the rich and powerful and it is not small farmers that are faring well. Rural people don’t simply make a living off the land, after all. Their land and territories are the backbone of their identities, their cultural landscape and their source of well-being. Yet land is being taken away from them and concentrated in fewer and fewer hands at an alarming pace. Then there is the other part of the picture: that concerning food. While it is now increasingly common to hear that small farmers produce the majority of the world’s food, even if that is outside of market systems, we are also constantly being fed the message that the “more efficient” industrial food system is needed to feed the world. At the same time, we are told that 80 percent of the world’s hungry people live in rural areas, many of them farmers or landless farmworkers. How do we make sense of all this? What is true and what is not? What action do we take to deal with these imbalances? To help answer some of these questions, GRAIN decided to take a closer look at the facts. We tried to find out how much land is really in the hands of small farmers, and how much food they produce on that land. When we looked at the data, we came across quite a number of difficulties. Countries define “small farmer” differently. There are no centralized statistics on who has what land. There are no databases recording how much food comes from where. And different sources give widely varying figures for the amount of agricultural land available in each country. In compiling the figures, we used official statistics from national agricultural census bureaus in each country wherever possible, complemented by FAOSTAT (FAO’s statistical database) and other FAO sources where necessary. For statistical guidance on what a “small farm” is, we generally used the definition provided by each national authority, since the conditions of small farms in different countries and regions can vary widely. Where national definitions were not available, we used the World Bank’s criteria. In light of this, there are important limitations to the data — and our compilation and assessment of them. (See Annex 1 of the full report for a fuller discussion of the data.) The dataset that we produced is fully referenced and publicly available online and forms an integral part of this report. Many of these conclusions might seem obvious, but two things shocked us. One was to see the extent of land concentration today, a problem that agrarian reform programmes of the 20th century were supposed to have solved. What we see happening in many countries right now is a kind of reverse agrarian reform, whether it’s through corporate land grabbing in Africa, the recent agribusiness-driven coup d’état in Paraguay, the massive expansion of soybean plantations in Latin America, the opening up of Burma to foreign investors, or the extension of the European Union and its agricultural model eastward. In all of these processes, control over land is being usurped from small producers and their families, with elites and corporate powers pushing people onto smaller and smaller land holdings, or off the land entirely into camps or cities. The other shock was to learn that, today, small farms have less than a quarter of the world’s agricultural land — or less than a fifth if one excludes China and India from the calculation. Such farms are getting smaller all the time, and if this trend persists they might not be able to continue to feed the world. Below we go through these findings point by point. By our calculations, over 90 percent of all farms worldwide are “small”, holding on average 2.2 hectares (Table 1). Even if we exclude China and India — where about half of the world’s small farms are located — from the calculations, small farms still account for over 85 percent of all farms on the planet today. In over two-thirds of all countries, small farms — as defined in each country — represent more than 80 percent of all farms. In only nine countries, all of them in Western Europe, are small farms a minority. Due to a myriad of forces and factors (such as land concentration, population pressure or lack of access to land) most small farms have been getting smaller over time. Average farm sizes have shrunk in Asia and Africa. In India, the average farm size roughly halved from 1971 to 2006, doubling the number of farms measuring less than two hectares. In China, the average area of land cultivated per household fell by 25 percent between 1985 and 2000, after which it slowly started to increase due to land concentration and industrialization. In Africa, average farm size is also falling. In industrialized countries, where the industrialization of agriculture is rampant, average farm size is increasing, but not the size of small farms. Notes: All figures on agricultural land obtained from FAOSTAT. Figures on number and size of farms obtained from national authorities wherever possible. Click to download the full dataset as a spreadsheet. Table 1 reveals another stark fact: globally, small farms have less than 25 percent of the world’s farmland today. If we exclude India and China again, then the reality is that small farms control less than a fifth of the world’s farmland: 17.2 percent to be precise. India and China merit special attention because of the huge number of farms and farmers they are home to. In these two countries, small farms still occupy a relatively large percentage of farmland. If we put the figures into a graph, we can see more clearly the disparity between the number of small farms and how much land they have. We find the most extreme disparities in some 30 of the countries for which we have sufficient data. Here, more than 70 percent of farms are small, but they are relegated to less than 10 percent of the country’s farmland. These worst cases are listed in Table 2. Source: Land distribution dataset compiled by GRAIN. The situation seems most dramatic in Europe, where decades of EU agricultural policies have led to the loss of millions of farms. In Eastern Europe, the process of land concentration started earnestly after the fall of the Berlin Wall and the enlargement of the European Union. Millions of farmers were forced out of business by the opening up of East European markets to subsidized farm produce from the West. In Western Europe, meanwhile, biased agricultural policies coupled with large-scale infrastructure, transportation and urbanization projects have been taking a vicious toll. Large farms now represent less than 1 percent of all farms in the European Union as a whole, but control 20 percent of EU farmland. A recent report by the European Coordination of La Via Campesina and the Hands off the Land Alliance found that in the EU, farms of 100 hectares or more, which represent only 3 percent of the total number of farms, now control 50 percent of all farmed land. Official data on farm losses and land concentration in Africa and Asia are harder to get, and the situation there is less clear, since contradictory factors and forces are often at play. In many countries with high levels of population growth in rural areas, small farmers are increasingly forced to divide their land among their children, resulting in smaller and smaller farms, as they have no access to more land. Another factor is urbanization and the covering of fertile farmland with concrete to serve expanding cities and their transportation needs. Yet other forces are the burgeoning spread of extractive industries (mining, oil, gas and now fracking), tourism, and infrastructure projects — and the list goes on. Overwhelming as these pressures are, perhaps the single most important factor in the drive pushing small and medium-sized farmers onto ever smaller parcels of land is the tremendous expansion of industrial commodity crop farms. The powerful demands of food and energy industries are shifting farmland and water away from direct local food production to the production of commodities for industrial processing. The rapid expansion of huge industrial commodity farms is a relatively recent phenomenon in Africa, while it has been going on for decades in many countries of Latin America (e.g., soybeans in Argentina and Brazil) and in several parts of Asia (e.g., oil palm in Indonesia and Malaysia). 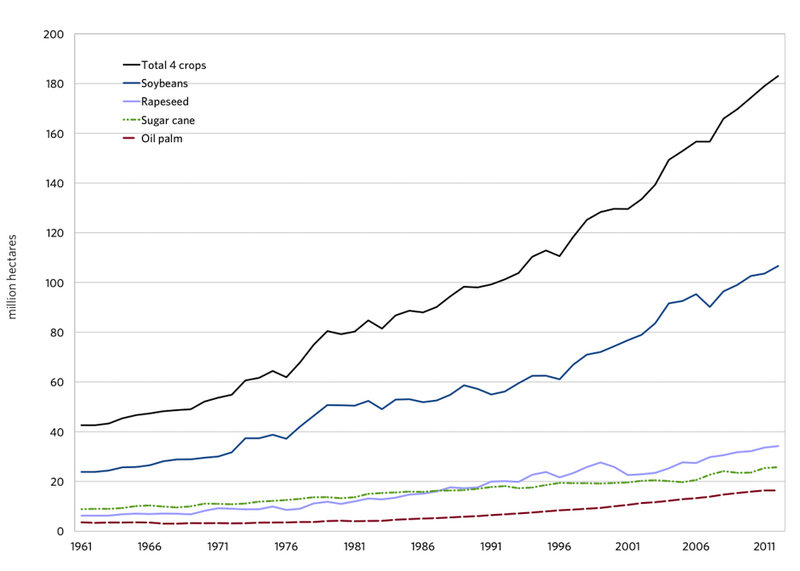 The graph above shows how just four crops — soybean, oil palm, rapeseed and sugar cane — have quadrupled the amount of land they occupy over the past five decades. All are grown mainly on big industrial farms. A massive 140 million hectares of fields and forests have been taken over by these plantations since the 1960s. To put things in perspective: this is roughly the same area as all the farmland in the European Union. And the invasion is clearly accelerating: almost 60 percent of this land use change occurred in the last two decades. This doesn’t take into account any of the other crops that are fast being turned into industrial commodities produced on mega-farms or the tremendous growth of the industrial forestry sector. The FAO calculates that in developing countries alone, monoculture tree plantations grew by over 60 percent, from 95 to 154 million ha, just between 1990 and 2010. Others put this figure higher, and point out that the trend is accelerating. Many of these new plantations are encroaching on natural forests, but they are also increasingly taking over farmland. A research team in Austria analyzed trade flows of agricultural crops in relation to land use. They concluded that the global area of farmland dedicated to export crop production grew rapidly —by about 100 million hectares (ha) during the past two decades — while the area producing crops for direct domestic use remained virtually unchanged. Without significant changes in government policies, this aggressive attack by commodity monocultures is set to expand further. According to the FAO, between now and 2050 the world’s soybean area is set to increase by one-third to some 125 million ha, the sugar cane area by 28 percent to 27 million hectares, and the rapeseed area by 16 percent to 36 million hectares. As for oil palm, there are currently 15 million hectares under production for edible palm oil (not biofuels), and this is expected to nearly double, with an additional 12–29 million hectares coming into production by 2050. Much of this expansion will happen in Africa, Asia and Latin America. Soybean and sugar cane are today mostly produced in Latin America, and oil palm in Asia, but these crops are also now being pushed aggressively into Africa as part of the global wave of land grabbing. This trend is compounded by yet another recent phenomenon: the new wave of land grabbing. The World Bank has estimated that between 2008–2010 at least 60 million hectares of fertile farmland were leased out or sold to foreign investors for the purpose of large-scale agricultural projects, with more than half of this in Africa. These massive new agribusiness projects are throwing an incalculable number of small farmers, herders and indigenous people off their territories. Yet no one seems to have a real grasp of how much land has changed hands through these deals over the last few years. The scores, possibly hundreds, of millions of hectares of agricultural land being taken away from rural communities are not yet captured in the official statistics that were available for this report. Another way of looking at land distribution is through the Gini index, a statistical tool that ranges from 0 (indicating perfect equity) to 1 (total inequity). For example, when calculated for income distribution, countries with a Gini index above 0.5 are considered “highly unequal”. GRAIN gathered Gini indices for agricultural land distribution in more than 100 countries. Most have indices exceeding 0.5, with many reaching 0.8 and some even surpassing 0.9. In the Americas, all countries for which we found information have indices over 0.5, and most of them reach to 0.8–0.9. In Europe, of the 25 countries for which this information is available, only three have an index under 0.5. Where more than a single year’s data was available, the most common tendency was for the index to go up, indicating that land inequality is increasing. Farmers’ market in Turkey. The role of women in feeding the world is not adequately captured by official data and statistical tools. Photo: Mick Minnard/Suzanne’s Project. At a time when agriculture is almost exclusively judged in terms of its capacity to produce commodities, one tends to forget that the main role of farming is feeding people. This bias has infiltrated national census data, too, as many nations do not include questions about who produces what and with what means. However, when that information is available, a clear picture emerges: small farmers still produce most of the food. They are feeding the world. The UN Environment Programme, the International Fund for Agricultural Development, FAO and the UN Special Rapporteur on the Right to Food all estimate that small farmers produce up to 80 percent of the food in the non-industrialized countries. Small farmers produce up to 80 percent of the food in the non-industrialized countries according to estimates by the UN Environment Programme, the International Fund for Agricultural Development, FAO and the UN Special Rapporteur on the Right to Food. If small farmers have so little land, how can they provide most of the food in so many countries? One reason is that small farms tend to be more productive than big ones, as we explain in the next section. But another factor is this historical constant: small or peasant farms prioritize food production. They tend to focus on local and national markets and their own families. Much of what they produce doesn’t enter into national trade statistics, but it does reach those who need it most: the rural and urban poor. Big corporate farms, on the other hand, tend to produce commodities and concentrate on export crops, many of which people can’t eat as such. These include plants grown for animal feed or biofuels, wood products and other non-food crops. The primary concern for corporate farms is their return on investment, which is maximized at low levels of spending and thus often implies less intensive use of the land. The expansion of giant monoculture plantations, as discussed earlier, is part of this picture. Large corporate farms also often have considerable reserves of land that lie unused until land that is currently being cropped or grazed is exhausted. Small farmers are not only our main source of food at present, but also for the future. International development agencies are constantly warning that we need to double food production in the coming decades. To achieve that, they usually recommend a combination of trade and investment liberalization plus new technologies. But this will only create more inequality. The real solution is to turn control and resources over to small producers themselves and enact agricultural policies to support them. In a recent paper on small farmers and agroecology, the UN Special Rapporteur on the Right to Food concludes that global food production could be doubled within a decade if the right policies towards small farmers and traditional farming were implemented. Reviewing the currently available scientific research, he shows that agroecological initiatives by small farmers themselves have already produced an average crop yield increase of 80 percent in 57 developing countries, with an average increase of 116 percent among all African initiatives assessed. Recent projects conducted in 20 African countries provided a doubling of crop yields in a short period of just three to ten years. The real question, then, is how much more food could be produced if small farmers had access to more land and could work in a supportive policy environment rather than under the siege conditions they are facing today? For some, the idea that small farms are more productive than big farms might seem counterintuitive. After all, we have been told for decades that industrial farming is more efficient and more productive. It’s actually the other way around. The inverse relationship between farm size and productivity has been long established and is dubbed “the productivity paradox”. In the European Union, 20 countries register a higher rate of production per hectare on small farms than on large farms. In nine EU countries, productivity of small farms is at least twice that of big farms. In the seven countries where large farms have higher productivity, it is only slightly higher than that of small farms. This tendency is confirmed by numerous studies in other countries and regions, all of them showing higher productivity on small farms. Although big farms generally consume more resources, control the best lands, receive most of the irrigation water and infrastructure, get most of the financial credit and technical assistance… they have lower technical efficiency and therefore lower overall productivity. Our data indicate, for example, that if all farms in Kenya had the current productivity of the country’s small farms, Kenya’s agricultural production would double. In Central America and Ukraine, it would almost triple. In Hungary and Tajikistan it would increase by 30 percent. In Russia, it would be increased by a factor of six. Although big farms generally consume more resources, control the best lands, receive most of the irrigation water and infrastructure, get most of the financial credit and technical assistance, and are the ones for whom most modern inputs are designed, they have lower technical efficiency and therefore lower overall productivity. Much of this has to do with low levels of employment used on big farms in order to maximize return on investment. Beyond strict productivity measurements, small farms also are much better at producing and utilizing biodiversity, maintaining landscapes, contributing to local economies, providing work opportunities and promoting social cohesion, not to mention their real and potential contribution to reversing the climate crisis. The role of women in feeding the world is not adequately captured by official data and statistical tools. FAO, for example, define only as people who get a monetary income from farming as “economically active in agriculture”. Using this concept, FAOSTAT indicates that 28 percent of the rural population in Central America are “economically active” and that women form just 12 percent of that group! This distorted view does not change significantly from country to country. However, when data is more specific, a totally different picture emerges. The last published agricultural census figures from El Salvador indicate that women are just 13 percent of “producers”, meaning farm holders, much in line with the number provided by FAO. However, the same census indicates that women provide 62 percent of the labour force used on family farms. The situation in Europe is better for women, but still highly unequal. There, the data show that women comprise less than a quarter of farm holders and on average have smaller farms than men, but provide almost 50 percent of the family labour force. 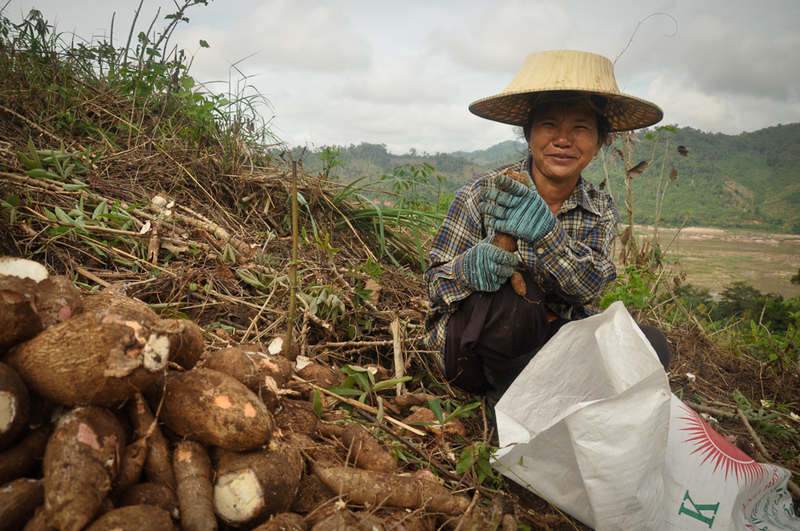 Growing cassava on the banks of the Mekong River: Small farms tend to prioritize food production over commodity or export crop production. Photo: New Mandala. Statistics about the role of women in Asia and Africa are difficult to obtain. According to FAOSTAT, only 30 percent of the rural population in Africa is economically active in agriculture and 40 percent in Asia – around 45 percent being women and 55 percent men. Yet studies carried out or cited by FAO show totally different numbers, indicating that in non-industrialized countries 60 to 80 percent of the food is produced by women. In Ghana and Madagascar, women make up about 15 percent of farm holders, but provide 52 percent of the family labour force and constitute around 48 percent of paid workers. In Cambodia, just 20 percent of agricultural land holders are women, but they provide 47 percent of the paid agricultural force and almost 70 percent of the labour force on family farms. In the Republic of the Congo, women provide 64 percent of all agricultural labour and are responsible for around 70 percent of food production. 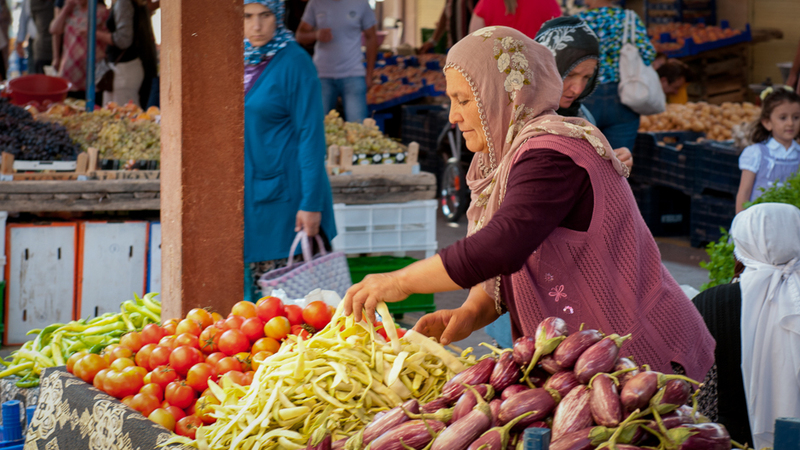 In Turkmenistan and Tajikistan, they are 53 percent of the active population in agriculture. There is very little data on the evolution of the contribution of women to agriculture, but their share would likely be growing, since migration is resulting in mostly women and girls picking up the workload of those who leave. According to FAO, fewer than 2 percent of landholders worldwide are women, but figures vary widely. There is broad consensus, however, that even where land is registered as family or joint property between men and women, men still enjoy much wider powers over it than do women. For example, a common situation is that men can make decisions about the land on behalf of themselves and their spouses, but women cannot. Another impediment is that in giving credit, governments and banks require women to present some form of authorization from their husbands or fathers, while men encounter no such barrier. It is no surprise, then, that available data show that only 10 percent of agricultural loans go to women. Additionally, inheritance laws and customs often work against women. Males tend to have priority or outright exclusivity in the inheritance of land. In many countries, women can never gain legal control over land, with authority passing to their sons if they are widowed for example. The data above support the contention that women are the main food producers on the planet, although their contribution remains ignored, marginalized, and discriminated against. As the data show, land concentration in agriculture is reaching extreme levels. Today, the vast majority of farming families have less than two hectares to feed themselves and humankind. And the amount of land they have access to is shrinking. How are small farmers supposed to sustain themselves in these conditions? Most families that depend on a small farm need to have family members working outside the farm in order to be able to stay on the land. This situation is often described euphemistically as “diversification”, but in reality it means accepting low wages, and bad working conditions. For the rural families of many countries, it means mass migration leading to permanent insecurity both for those who leave and for those who stay. Also, living and working on a small farm often consists of long and difficult working hours, no holidays, no pensions, no retirement for the elderly and irregular school attendance for children. 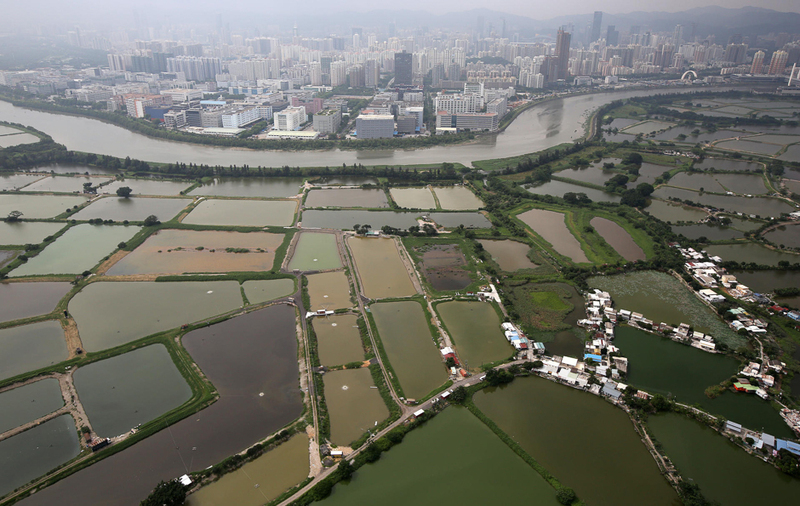 Urban development encroaching on farmland outside Shenzen, China. How much more food could be produced if small farmers were not under siege? Photo: Robert Ng. If this land concentration process continues, then no matter how hard-working, efficient and productive they are, small farmers will not be able to carry on. The concentration of fertile agricultural land in fewer and fewer hands is directly related to the increasing number of people going hungry every day. Genuine land reform is not only necessary, it is urgent. And it must be carried out in line with the needs of peasant families and small producer communities. One of these needs is that land be redistributed to small farmers as an inalienable good, not as a commercial asset that can be lost if rural families are not able to cope with the highly discriminatory situations that they face. Farming communities should also be able to decide by and for themselves, and without pressure, the type of land tenure they want to practice. The situation facing women farmers also requires urgent action. Many international agencies and governments are currently discussing these issues. Land access for women is specifically part of the Millennium Development Goals. The FAO has written numerous documents advocating for women’s rights over land and agricultural resources. The issue is being considered by the UN Development Programme, the World Bank, the Gates Foundation, the G8 and the G20, among others. However, what these institutions are advocating is often not what women farmers and women’s organizations have been struggling for. Such institutions often advocate a system of land rights based on individual property titles that can be bought and sold or used as collateral. This is likely to lead to further concentration of land, just as the allocation of individual land property rights to men has done historically around the world. Doing nothing to turn this situation around will be disastrous for all of us. Small farmers — the vast majority of farmers, who tend to be the most productive and who produce most of the world’s food — are losing the very basis of their livelihoods and existence: their land. If we do nothing, the world will lose its capacity to feed itself. The message, then, is clear. We urgently need to launch, on a scale never seen before, genuine agrarian reform programmes that get land back in the hands of small and peasant farmers. This article appears courtesy of GRAIN. GRAIN does not recognize or enforce copyright on its work and you are free to copy, translate and distribute any material authored by GRAIN on their website. GRAIN only asks that the original source be acknowledged and that you send them a sample of your reprint, repost or translation.